Many consumers who are interested in starting a family, growing a family or simply breaking their ties to landlord & tenant agreement want to know how to save for a down payment. You may want to learn how to save for a down payment on a house fast – such as within the next 10-12 months. On the other hand, you might just want to learn more about opening a down payment savings account to help you generate even more funds to help you reach your homeownership goal sooner. Before you dive into saving for a down payment, you should first consider what your credit report shows. Do not just focus on the credit score itself. Dig deeper into the report to make sure that you can see everything that is factored into the score – good and bad. For instance, if you want to know how to save for a house in a year, you can use a credit monitoring service such as Credit Sesame to retrieve your credit report and study the report line-by-line. Using that type of service will also make it easier to monitor your credit history and the progress/decline of your score. Click here to find out how Credit Sesame can offer your credit score for FREE! Keep in mind that your credit score ranges between 300 and 850. Your actual score takes a few key factors into consideration to determine if you are a good credit risk. If you are a good credit risk, it will be much easier to know how to save for a down payment on a house fast. This is especially since lenders may not require as high of an initial payment from you based on your credit history. The factors with the most significant are your payment history and outstanding debts. However, your credit history length, credit types used, and new credit amount are also factored into the calculation. Studies have shown that those with credit scores lower than 650 will experience the most difficulty with securing loans and lines of credit. Therefore, if you have noticed that your credit score is below 650, you should study your credit report closely. If you have bad credit, there are still certain lenders, such as BadCreditLoans.com, that may be willing to work with you. Work hard to determine the cause of the problem and make the necessary adjustments to improve your score. Remember that you are entitled to receive a free copy of your credit report from each of the three major credit bureaus each year. Some lenders may pay closer attention to one specific credit bureau over the other. However, you should focus on analyzing the reports from all three at the same time for the best long-term results. Click here to find out exactly how you can get approved for a loan with BadCreditLoans.com! Once you have taken the time to study your credit report and identified the areas that you want to target, it is time to get to work. As you work towards improving your credit score, you should keep in mind that with each increase, your down payment amount could potentially decrease. Lenders are much more likely to give consumers with high credit scores substantial mortgage loans with reasonable interest rates and other associated terms. Otherwise, with a relatively low credit score, you run the risk of paying a lot more for the same in house in the short-term and long-term than you would have with a little quality time spent on credit repair. Study your credit report closely and focus on the legitimate debt that you know you owe without exception. Work hard to clear that debt as quickly as possible or at least maintain a positive payment history. Click here to see how you can buy a home for as low as $500 a month! Search for any inaccuracies, discrepancies or errors that may exist within your credit report. You must pay close attention to these issues and dispute them as soon as possible. A successful dispute will revise incorrect information and eliminate any inaccurate data completely – both actions that can have a profound impact on the strength of your credit score. Many consumers suffer and struggle with low credit scores simply because they have never taken the time to analyze and properly dispute various errors and/or mistakes within their credit reports. Filing a dispute is not an overnight process; patience is required. You must wait to see how the investigation into your dispute plays out to get an accurate reflection of its effect on your credit report. It is imperative for you to stay on top of the dispute process. Follow through with each required step and check the status of your claim regularly until the results are finalized. Aside from rebuilding your credit history with new payment history and debt pay-offs, having these errors removed legitimately is an effective way to boost your score. You will also be able to improve the quality of your credit report. The next step is to calculate the projected down payment amount that you want to accumulate. The general rule of thumb is that the more money you can pay upfront towards your mortgage loan, the more favorable terms and conditions you will receive in the long-term. Ideally, it is recommended to save between 10-20% of the desired purchase price – which means you must first determine the purchase price you want and can afford. For instance, if you want to purchase a $200,000 home, it is recommended to save $20,000-$40,000 if you want to know how to start saving from a home. Once you have identified the exact amount that you need, you will still need to calculate the timeline required to reach your goal. The worst thing you can do is jeopardize your current credit standing by skipping payments. It is also not wise to allow certain debts to head to collections just to put more money towards your down payment. That would essentially make all the time and effort that you put into repairing, rebuilding or reviving your credit score futile. Fortunately, there is a wide variety of tools and resources that can help you to manage your finances and stay on top of your expenses. For example, TrueBill allows you to connect your various accounts to a mobile application and have full control to track upcoming bills and keep up with monthly saving/spending goals. Setting a firm timeline will help you to view a substantial amount of money (such as $20,000-$40,000) with a healthy perspective. For example, a typical timeline used by consumers who want to learn how to save for a down payment is one year. An effective way how to save for a house in a year would be to break it up into smaller payment amounts. For instance, a $40,000 payment can be broken down into saving $3,330 a month to reach your goal within the year. If you want to stick to a projected timeline of 5 years to save up the same $40,000 down payment, you will need to save $8,000 a year – which breaks down into a little over $660 per month. Applying a sizeable down payment towards your overall purchase price will save you a considerable amount of money in the long run. It will also make it easier for lenders to offer you favorable terms and interest rates. Many consumers do not realize that they can establish a down payment savings account that will help to reserve funds each week or month specifically for the desired investment. Depending on how long you will save your money, it might be wise to consider accounts with rising interest rates that will help your money to essentially make money as you save it. There are even mobile apps – such as Digit and Empower – that will help you to manage your savings separately from your standard mobile banking applications and websites. An app like Digit can analyze your spending and automatically save your money each day! It will boost your morale and overall excitement when you see the progress that you make month after month. Over time, you will watch your savings grow and the remaining amount needed for your down payment shrinks. Self-discipline, commitment and patience are all required for this part of your down payment savings plan to work. You likely will not be able to save up the down payment as quickly as you might dream. However, persistence and patience will pay off in the end if you do not derail your own train of progress. Once the money has been applied to your savings account, follow the simple rule of not touching it again. Therefore, it is recommended to have an emergency savings fund separate from your down payment savings account. In addition to your plan for reaching the target down payment amount, you should also consider associated expenses that must be paid. It would also be in your best interest to follow an automated savings plan. Make sure that your plan does not require manual intervention for reallocating and transferring your funds. Fortunately, your bank institution or money-managing mobile application will help you to set up scheduled transfers to handle this task regularly. At this stage of the process, you have already studied your credit report and made the necessary adjustments. You also learned the importance of improving your score and calculating the ideal down payment amount you want to save. Within your story of how to save for a down payment, you also protected a timeline and established a savings strategy that allows you to put the necessary funds aside each month. Next, you want to focus on finding effectives to increase the income generated each month while reducing your expenses at the same time. For instance, you may pay certain reoccurring fees each month that could be eliminated to add money to your down payment savings plan. This includes gym memberships, cable subscriptions, clothing expenditures, and top-shelf grocery shopping trips. It may surprise you to see just how much money you will save over time just by making a few cuts here and there to your spending habits. In addition, the same surprise factor applies to the amount of money you can make with side hustles, second jobs and other legitimate avenues available through the Internet. There are even some methods that will allow you to generate passive income in your sleep – income that you can reserve specifically for your growing down payment savings account. You might view the concept of taking on a second job as nearly impossible or overwhelming – especially when you consider the weighty burden that you already carry daily. However, you must also consider the long-term relief that you will receive with the added income that you generated from your second job. You can use this income to bring you one step closer to getting the keys to your new home. Be creative when cutting expenses but remain cautious to ensure that your credit standing, and history are not adversely affected along the way. Click here to read more about the 5 best side hustles that you can turn into a full-time business! Remember to cut overhead expenses and find creative ways to make money to supplement your full-time income. As you do, you should also examine the margins of your household income to find even more opportunities. Think about all the extras and “premium services” that you pay for each month that could potentially take money away from your down payment. For instance, the amount of money saved between contract vs prepaid cell phone service, cable service vs basic TV and even varying bandwidths for high-speed Internet services can add up much sooner than you realize. Perhaps you have a considerable amount of valuable goods and products within your home that you can sell. Quite a few people have supplemented or even replaced their income by selling used goods through online websites and auctions. Click here to learn how to benefit from the bill negotiator Cushion and start saving money right away! If your employer provides you with an annual pay raise or end-of-the-year bonus, you should consider investing it into your down payment savings account. This is known as a typical “windfall” – a periodic lump sum payment that you did not initially factor into your budget. Examples of common windfalls include substantial commission checks, personal asset sale profits and income tax refunds. Instead of rushing to spend the funds generated by these windfalls on unnecessary purchases or desired items from a consumer wish list, add these funds into your down payment savings plan. You may have saved up hundreds or thousands of dollars for your next family vacation. Why not invest that money into your down payment and have your next family vacation in your new family home? There are also other financial targets that may have held your attention for years that perhaps need a different perspective as you learn how to start saving for a house. For example, a primary target to consider is your retirement savings accounts. If you plan to buy a house, it is recommended to stop deferring money to your retirement savings temporarily. On the contrary, you should redirect and reinvest those funds into your down payment savings account. Keep in mind that this is only a good idea if your projected timeline outlining how to save for a down payment is 1-2 years. Let’s say that your current strategy invests $600 into IRAs and 401(k) plans each month from your full-time salary. By pausing your retirement plan deferrals and reinvesting the same amounts into your down payment savings account, you could save $7,200-$14,400 in 1-2 years. If you have a much longer timeline in mind (such as 3-4 years), you may want to delay any changes to your retirement savings plan until you approach the end of that period. Never consider borrowing cash from your retirement accounts to add money to your down payment. This is not a financially sound idea and will more than likely backfire on you. In addition to receiving early withdrawal penalties and taxes, you will drastically damage the long-term potential of your retirement savings by doing so. One of the most important steps to take for those consumers who focus on how to save for a down payment is the long-term patience and persistence required. As mentioned above, you may not be able to achieve your goal overnight – especially if you have a poor credit history or other financial factors that get in the way. A long-term commitment to this process is the key to success. Otherwise, you are simply setting yourself up for failure. 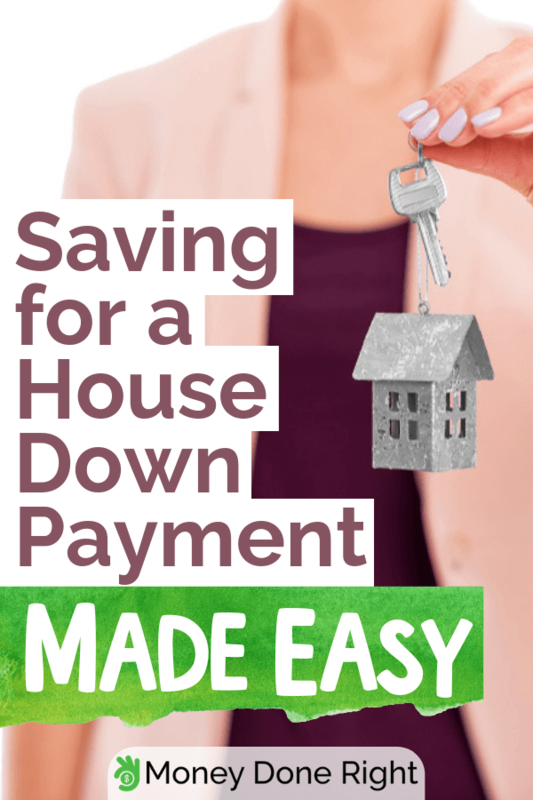 It may seem very difficult to learn how to save for a down payment or – more specifically – how to save for a down payment for a house fast. However, if you work with an experienced real estate professional on your projected timeline, you will eventually fulfill your dream of becoming a homeowner. Have any extra tips on how to save for a down payment? We’d love to hear them – so go ahead and leave us a comment below!